Welcome back to a beautiful Saturday with Shavara! Let’s talk about Earth Day; an annual event celebrated on April 22ndworldwide in a demonstration of support for protecting our environment. Today there are a whopping 193 countries that celebrate the day, which is no small feat considering that it was started by three people. The inaugural observation of Earth Day started on April 22nd, 1970 and was launched by a trio led by U.S Senator Gaylord Nelson of Wisconsin, Harvard student Denis Hayes and eco-activist Paul Erich. There is no way to tell if the three had any idea that this event they coined Earth Day would be so successful, but there was an outstanding 20 million Americans that took to the streets, auditoriums, classrooms and parks to demonstrate their support for the health and sustainability of our environment. Among the 20 million it was recorded that two thousand colleges and ten thousand primary and secondary schools were in participation of the inaugural day… shout out to the Baby Boomer generation! The wave of environmental awareness ignited by Earth Day led to some pretty amazing changes in our government which were; the establishment of the Environmental Protection Agency, the Clean Air Act, the Clean Water Act, the Endangered Species Act, the Resource Conservation and Recovery Act, and the Federal Occupational Health and Safety Act. Today Earth Day has become the largest secular day of observance in the world, with it being celebrated by more than a billion people each year. I don’t want you to think that your participation has to be some large grand gesture it can be something as simple as picking up a piece of trash on a walk, or the planting of a few trees. Just think the shade and wind buffering created by trees reduces our annual heating and cooling cost by close to 2 billion dollars annually and with 4 million pounds of plastic being dumped into the ocean each year imagine how much can be diverted if every person picked up just one piece. Earth Day has also generated an entire job industry around recycling, reuse and manufacturing that accounts for roughly 3 million jobs in the U.S. In honor of Earth Day and my desire to make my own environmental impact I will leave you with some facts that will hopefully get you motivated to get out and do something. Consider planting a tree because every minute we lose 56 acres of forest, 18 million acres are lost each year, the amount of paper and wood thrown away every year is enough to light 50 million homes for 20 years. Even something simple like requesting a receipt be emailed or texted to you versus being printed those pesky things can’t even be recycled because of the type of treatment done to the paper. Try spending the day outside, cutting down on time spent in the car and house will cut down on the amount of greenhouse gas that is emitted by both. There are so many ways you can honor Earth Day. Many organizations and educational institutes host Earth Day events that are a fun and educational way to learn more about ways to protect the planet. I challenge you all to get out and make this year your best by doing your part to honor our planet as always Reduce, Reuse, Recycle when and where you can and be green on this beautiful holiday. Saturday's with Shavara .. So what's the deal with Bees? Welcome back to an official spring Saturday with Shavara! I’m sure many of you have noticed the return of our outdoor creatures and insects as the temperatures have gotten warmer. The return of wildlife also indicates the return of many of our blossoming plants, and for some of us who can’t stand the cold we too are ready to venture out and be one with nature. For me this time of year is a reminder of the important roles both big and small that each of us play in our environment. Specifically, I want to highlight the very big role that a small packaged insect makes on the biodiversity of our planet; that insect is the Bee. Bees are responsible for pollinating roughly one-sixth of the flowering plant species worldwide and that equates to around 400 different types of plants. The service that Bees provide us equals out to around $19 billion worth of agricultural crops in the United States alone; which is one-third of EVERYTHING we eat. Who knew Bees were working that hard? … And to think what they could have charged us for their free labor! You may be wondering what pollination entails and why it matters to us and more importantly the thriving of biodiversity. Pollination is the transfer of pollen from the male part of the flower (the anther) to the (stigma), which is the female part of the flower. Once the two parts of the plant are combined BOOM a plants seed, nut or fruit is created. To make that definition as simple as possible pollination is essentially plant reproduction. I really want to nail home the message of the importance of bees’, so bear with me as I throw a few more numbers at you. Roughly 30% of the world’s crops and 90% of all plants require cross pollination from bees’ and other pollinating animals to multiply and thrive. On a global scale those numbers break down to mean that ¾ of food crops require Bee pollination. I have always been under a pretty simple-minded assumption that bees went around visiting flowers, making honey and on occasion stinging people, but there is so much that they are responsible for. Some examples of foods that would literally not exist are; broccoli, asparagus, cantaloupes, cucumbers, pumpkins, blueberries, watermelons, almonds, apples, cranberries, and cherries ...WHEW they seem to be living up to the nickname “Busy Bee.” Bees act as our number one pollinator protecting and maintaining ecosystems as well as plants and animals’ biodiversity as a result of their hard work. Their presence or lack thereof is also an indication of the health of the environment. Having tackled the importance of Bees I want to leave you with some tips on how to support your local Honey Bees ability to thrive and do their job; plant bee friendly flowers and flowering herbs in your garden, avoid using chemicals and pesticides in your garden or in your lawn if applied while flowers are in bloom the pesticides actually make their way into the pollen and nectar, into the hive and then eventually into our food supply. Make an effort to buy local honey which indicates to the Beekeepers in your area that their Bees are necessary. The may be little, but their role is a big one it is in our best interest to support the hard-work that they are doing for our environment. Remember as always to Reduce, Reuse, Recycle and reflect on your role in our environmental sustainability. (Oklahoma City, March 25, 2019) – Keep Oklahoma Beautiful (KOB) celebrates the winners of our elementary and middle school Litter Education programs, UnCapped and UpCycled contest! These KOB programs, with the mantra is “Every Litter Bit Hurts” provide opportunities to create young environmental ambassadors by offering creative projects that teach students about the harmful effects of littering. In the Fall of 2018, many hopeful participants registered for our Litter Education programs. These programs are made possible through our sponsor and longtime partner, Oklahoma Department of Transportation (ODOT). One of the founders and sponsors of Every Litter Bit Hurts campaign, is Director J. Michael (Mike) Patterson. Director Patterson has been an invaluable proponent of engaging students and helping them use their talents to be future environmental ambassadors. From the launch of End Litter, a high school and college litter video contest in 2011, Director Patterson has dedicated his efforts in spreading the message of Litter Education, growing the program into two additional grade levels. After serving ODOT and KOB as a sponsor, partner, and friend for many years, KOB appreciates Director Patterson and his devotion to our state and our future green leaders. UnCapped engages 4th & 5th grade students to take action in understanding the importance of recycling in Oklahoma by creating a work of art from plastic bottle caps and submitting a class-collaborative essay about why recycling is important. Our fall 2018 UnCapped winners in Ms. Manal Dabboussi’s 5th grade Art class from Mercy School Institute of Edmond, OK created their project titled “Trash to Treasure” and submitted it along with their winning class essay. UpCycled is a program for 7th and 8th grade students to understand the consequences of litter and the hazards/dangers of landfills. Teachers in this program are encouraged to take their students to visit a local landfill. Our UpCycled winners from Mrs. Sandra Berry’s 8th grade class of Eisenhower Middle School in Lawton, OK created "upcycled" art, by using items that might otherwise have been thrown away. Along with their winning class collaborative essay, Mrs. Berry’s class project titled “Water Bottle Woes to Wow” consisted of recycled water bottles that were cut into spirals and dyed to be repurposed as bird feeders. Their class essay describes the importance of reusing items and the effects of landfills and excessive waste. As a prize for their hard work, KOB Executive Director Jeanette Nance and ODOT Director Mike Patterson had the opportunity to treat the winning classes with a pizza party at their schools. In partnership with the Thunder, they also received tickets to a Thunder game where they were able to meet the NBA Thunder player Steven Adams. The contest winners were also recognized at our 28th Annual Environmental Excellence Celebration in November 2018. Happy Valentine’s Day week green friends! I wanted to do something a little special in the name of love … love for the earth that is, so I have taken a jump from my typical Saturday spot by bringing you something to think about as we approach Valentine’s Day this Thursday. The above quote sums up my desire for all of us to love the earth just as much as anyone or anything else on a day about love. There is much that I have discovered about the environmental impact of one of America’s favorite holidays, but along with that discovery I have also found many ways to celebrate this majestic day in a more environmentally responsible way. I want to start with a few facts about Valentine’s Day that peaked my interest, the first being that the practice of passing out Valentines is a 600-year-old tradition, the oldest on record was a poem written by Charles Duke of Orelans that he wrote to his wife in 1415. Now to me that sounds like a long time and a LOT of paper. I bet some of you are wondering, “well just how much paper is being used compared to other holidays?” Let me help make more sense of how many cards on average per year this equates to: roughly 144 million cards are exchanged every year according to Hallmark, those cards laid end to end would stretch around the world 5 times woah. Valentine’s Day cards sent out account for the second largest card-sending holiday falling second only to Christmas cards, which is 25% of the total seasonal cards market. I don’t want to take the joy of giving cards, so consider that instead of buying a traditional card making one. If creativity really isn’t your thing you can also purchase cards made out of recyclable paper or send an e-card. The truth of the matter is the pulp & paper industry is a huge contributor to the carbon-dioxide emitted and water resources used, and let’s not even get into how many trees the card production industry cuts down to make all of these cards. If you’re anything like me you stare lovingly at your card for a few days, and then it ends up either in a drawer never to see the light of day or discreetly tossed in next week’s trash. Now that I’ve had my little rain cloud moment with traditional Valentine’s Day cards, I unfortunately have to be the bearer of more bad news, which is the harm in purchasing fresh, but likely imported flowers. I know, I know I truly seem to be taking all the fun and ease out of the holiday, but it’s for a good cause to inspire change. Fresh flowers are purchased on Valentine’s Day more than any other holiday, with roses being the most popular; according to the American Greetings Corporation. This can be dangerous because the flower industry has a very loose regulatory status because flowers are not an “edible” crop, therefore they are exempt from regulations on pesticide residue. Imagine here you are trying to give this beautiful expression of love and turns out it just a giant bouquet of pesticide ridden roses. The transportation of these roses from other countries also come with a high environmental price tag of emissions that vehicles produce to get the flowers into the commercial market at the volume sold on Valentine’s Day. There are ways to off- set this, some of which would be to shop at local farmers markets for flowers grown in season and native to the state that you live in or try your hand at a potted plant and help your loved one tap into their inner green thumb. If you want to mix an activity in the form of a gift, set up a tree planting date to celebrate your love for the earth as well as your love for your special someone. All in all Americans spend $8 billion dollars eating out on Valentine’s Day, so I challenge you this year to circulate those dollars in your own community by eating local, or preparing a romantic dinner at home. You can take your new-found green Valentine’s Day mojo and cut the amount of electricity you use by having a candle lit night with an electronic free night. The sentiment behind the holiday doesn’t have to be lost simply because you are more environmentally aware, if anything it should strengthen the real meaning of the day; emitting nothing but love and kindness through all actions including those done to protect the planet. I leave you all to responsibly enjoy your holiday with my typical reminder to Reduce, Reuse, Recycle! Announcing 2019 ODOT Beautification Grant Winners! Eight Winners located across Oklahoma! Oklahoma City, Okla. - Keep Oklahoma Beautiful (KOB) in partnership with Oklahoma Department of Transportation (ODOT) has announced 2019 ODOT Roadside Beautification Grant recipients totaling up over $22,000 to eight KOB affiliates. 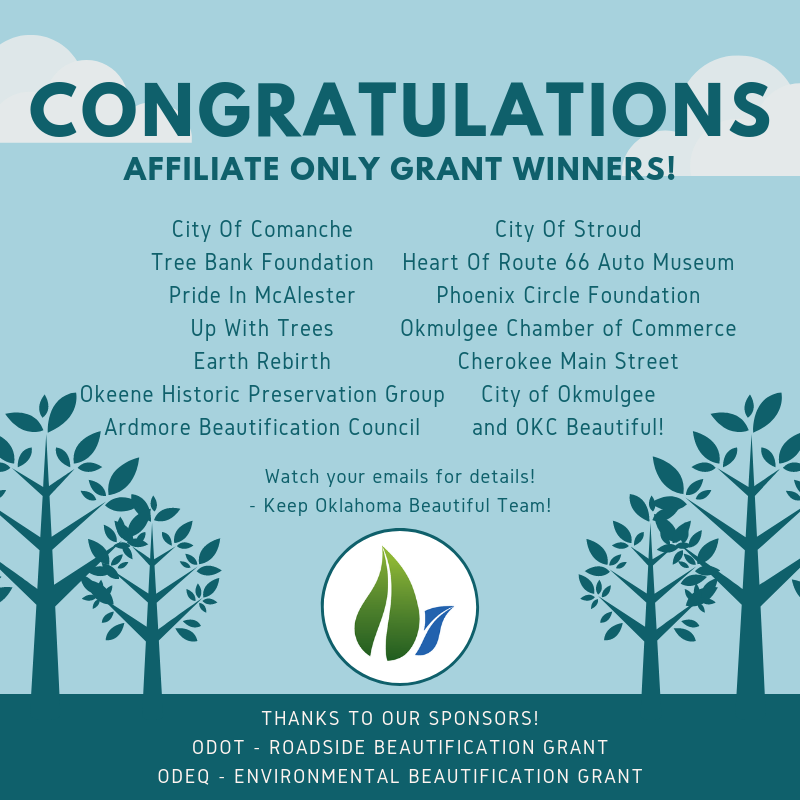 "Keep Oklahoma Beautiful is thankful to our sponsoring agency ODOT for making these grants possible to our affiliate network,” Jeanette Nance, Executive Director, KOB said. “We appreciate the good works of our partnering communities and the ability to fund such worthwhile projects is key to keeping Oklahoma a beautiful, healthy, sustainable place to live and thrive." ODOT Roadside Beautification Grants are awarded through an application process open to KOB affiliates who propose beatification projects to be completed within six months. The City of Stroud will be installing a full-size replica of an Ozark Trail Monument in Centennial Park on Route 66. Heart of Route 66 Auto Museum will be creating space between their extended parking lot and their front door. Ardmore Beautification Council is using their grant to revitalize projects of landscaped medians. The City of Okmulgee will be adding a city entrance sign on Hwy 75. Okmulgee Chamber of Commerce will use their grant funds to paint a mural on the 6th St side of the Okmulgee Chamber of Commerce building. Cherokee Main Street will be adding seven flowerbeds to accommodate the 13 bump-out areas along their main street. OKC Beautiful will use their grant funding to expand their wildflower-planting program. Okeene Historic Preservation Group will purchase and install new framing around windows to restore the Dusbabek building. Happy 2019 Green Friends! Welcome back to another Saturday with Shavara. I’ve missed you all during my December winter hibernation. Much like the new year has crept up on us, I too am back and ready to bring you some compelling information that will hopefully illicit some environmental change. Aside from the many New Year resolutions we make in the month of January there is something else that begins to occur more frequently as we creep through the cold winter months, and that friends is winter weather. Now some may love the look and feel of snow more than others, but if I had to make a guess I would say absolutely no one enjoys the bad weather driving conditions. Ice and sleet are sure to make a typically boring trip to the grocery store feel more like an Indiana Jones adventure. Our state, municipalities and cities are responsible for our major roads and typically handle winter weather by salting and using de-icing concoctions to assist in melting snow and preventing ice, but have you ever wondered what becomes of that salt mixed snow once it’s removed? Well it is your lucky Saturday because I am here to tell you all about it! In typical fashion, I had a desire to learn more about the environmental impact of snow removal/disposal, which was sparked by a fleeting memory of my time living on the East Coast where I would notice the mounds of “dirty snow” being piled against curbs that later seemed to just vanish. At the time it was easy to disregard that snow and I looked forward to the “snow fairies” a.k.a snow plow workers making it disappear, so that driving was made easier. I never once wondered about that removal process and its impact on the environment, that is until now. Snow that is removed from roadways plays a pretty significant role in water pollution in the winter because it is able to accumulate all types of contaminants as it’s scraped up, and often times dumped in, or near bodies of water. This form of pollution is referred to as non-point source water pollution; human induced pollution originating from sources such as agricultural and urban activities according to denr.sd.gov. The snow that is removed from roadways can contain salt, salt additives, heavy metals, asbestos, petroleum products, bacteria and organic chemicals. All of this makes for a pretty gross concoction for our waterways if you ask me. Over 22 million tons of salt are scattered on the roads of the U.S annually, which is roughly 137 lbs for every person; according to a study done by the University of Massachusetts. The problem is that as much as we need salt and salt additives to prevent our roads from feeling like a Slip N’ Slide we also have to be responsible with how much we use and how that treated snow poses a risk when removed improperly. When snow is disposed of improperly marine wildlife can be greatly affected by the added salt and contaminates contained in said snow. Freshwater animals need an internal salinity greater then the salinity of the water they live in, if this is not the case the fish have to use more energy to produce the ions that help them to keep water in their bodies, which leads to the added use of energy. The strain on wildlife as they deal with the added contaminants to their environment can lead to damaged cells and even cause death. The road salt actually reduces swelling of the Salmon eggs, which restricts the development and can cause deformities. Now ideally some future genius will come up with a completely new method to clear our roads, but until then we can all do our part to minimize the road salt we use in our own driveways and sidewalks. Here are a few tips which suggest shoveling first, use salt on ice only, avoid applying salt near plants and be mindful of the salt that collects on your car because washing your care can lead to salt flowing off into storm drains. Many of us… myself included are guilty of spreading salt very liberally, sprinkling it like fairy dust over every square inch of driveway and sidewalk, so remember to apply only what is absolutely necessary. Storing salt properly is also very important ( and I know what you’re thinking it seems like a lot of attention is being focused on something so small ). We can also make sure our cities and municipalities are being responsible with snow removal, many cities have mandates in place that require the placement of a silt fence between snow dumps and waterways. Keeping salt piles covered and keeping it stored a distance from bodies of water is also a way to prevent water pollution. Reporting cases of improper snow disposal or salt storage to city officials keeps our cities and ourselves responsible for the water quality for marine life that doesn’t have a voice of their own. It takes everyone to protect our environment, and as always remember to Reduce, Reuse, Recycle. Nearly $62K in affiliate grant applications were received! Oklahoma Department of Transportation and Oklahoma Department of Environmental Quality painstakingly reviewed each one trying to determine which to grant our available $40K to. While we would love to fund every one... Following are the communities whose projects were approved! !